Jeremy Corbyn has accused Prime Minister Theresa May of having led the UK into a "national crisis" on Brexit. 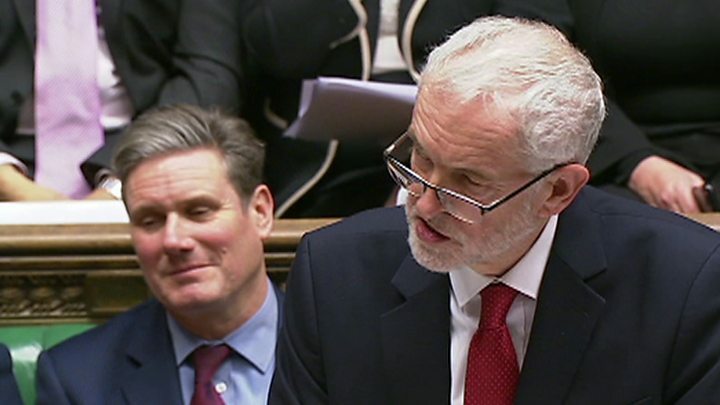 The Labour leader told the Commons she had "cynically run down the clock" to force MPs to pick from "unacceptable outcomes" - her Brexit deal or no deal. Since delaying last week's Brexit vote, she had won no "meaningful reassurance" about MPs' concerns, Mr Corbyn said. Mrs May had been "dragged, kicking and screaming" to schedule the vote for the week of 14 January by Labour, he added. She hit back, saying that Labour had "no alternative and no plan" and "the national crisis is an opposition that is irresponsible, that puts its party interest first before the interests of the British people". Ahead of her Commons statement on Monday, Labour had threatened to push for a confidence vote in the PM if she failed to timetable a vote. Afterwards, a party spokesman said it was "disgraceful" that - by that date - a month would have been "wasted". And Mr Corbyn later confirmed he had tabled the motion. MPs had been due to vote on the deal on 11 December but the prime minister postponed the vote, saying it was clear her plan "would be rejected by a significant margin". The delay prompted angry Conservative backbenchers to trigger a party leadership challenge, which she survived by a margin of 200 to 117. Mrs May spent the end of last week in Brussels, saying she was focused on getting the additional assurances from EU leaders demanded by MPs to address concerns over the Northern Irish "backstop". Many MPs fear that in its current form, the arrangement - a temporary "insurance policy" at preventing the return of physical border posts in the event no future EU-UK trade deal came into force - would in reality see the UK subject to EU customs rules for the long term. In her Commons statement, Mrs May insisted she had won fresh guarantees at last week's EU summit, and hoped to secure additional "political and legal assurance" in the coming weeks. But Mr Corbyn responded: "The prime minister has failed to renegotiate her deal, failed to get any meaningful reassurances." He told MPs: "The deal is unchanged and not going to change. This House must get on with the vote and move on to consider the realistic alternatives." Pointing to reports that cabinet ministers had suggested pursuing alternatives, Mr Corbyn added: "We are left edging closer to the 29 March deadline without a deal and without even an agreed plan in cabinet to get a deal." The SNP's Westminster leader Ian Blackford said: "We thought the prime minister had reached rock bottom, but she's still digging." Mr Blackford called on Mrs May to "stop operating in isolation" and meet opposition leaders to discuss a way forward. The PM said she was happy to meet Mr Blackford but warned they would have a "fundamental difference of opinion" on Brexit. He was later granted an emergency debate by Speaker John Bercow to follow up the prime minister's statement. Downing Street has distanced itself from an idea floated by several cabinet ministers for a series of non-binding votes on different Brexit outcomes to try and provide a way forward if the PM's deal is rejected.